On Saturday, September 17, 2011 the clerk at the Tackle Box in Fanning Springs reported a robbery. The clerk stated that he locked the front door to handle business in the back and he heard someone attempting to open the door. The clerk went to the front door and let the white male in since the store was open for business. The suspect followed the clerk behind the counter and stated that he needed cigarettes. The clerk told him to remain on the opposite side of the counter. The suspect pushed the clerk and had his right hand under his shirt as if he had a weapon. The suspect had the clerk open the register and the suspect removed an undetermined amount of cash. The suspect is described as a white male, approximately 5'07", 140-150 lbs, with short reddish to light color hair and clean shaven. He was wearing a sleeveless white shirt and plaid white & black shorts. The suspect left north on Us Hwy 19 in a white extended cab pickup truck. Deputy Drew was minutes from the robbery and searched for the suspect in Dixie County to no avail. Anyone who has information on this incident is asked to call Investigator Mike Bell at 352-486-5111. On September 14, 2011 a state wide bolo (Be on Look Out) was issued for a murder suspect possibly driving a green Ford Explorer from Riviera Beach, Fl. Shortly after 5 Pm the Ocala Police Department located the suspect's vehicle and attempted to conduct a felony traffic stop. 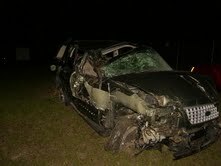 The driver refused to comply and a high speed chase ensued through the city of Ocala. The driver continued to elude officers and went northbound on Hwy 27 through Fellowship and Blitchton. Ocala Police Department notified the Levy County Sheriff's Office that they were going to enter Levy County and the suspect was considered armed and dangerous. Major Evan Sullivan took over the pursuit at the Levy/Marion County line and the chase continued through the city of Williston. Sgt Wilbur Wells with Levy County Sheriff's Office set up stop sticks at Olive Drive & Hwy 27 and was successful in deflating the tires on the suspect's vehicle. The suspect continued northbound and his front/rear tires on the passenger side exploded. Refusing to stop, the suspect lost control and veered off the road in the area of Cr-102 & Hwy 27 striking several trees before coming to a rest on the passenger side. The driver was transported to a local hospital where he is in stable condition. The driver of the Explorer was identified as the murder suspect, Robert Lee Benjamin, 55 years of age, from Riviera Beach, Fl. The Levy County Sheriffs Office will sponsor a concealed weapons permit class Oct 8, 2011 the class will be 8am at the Levy County Sheriffs Office Classroom 9150 NE 80th Ave Bronson Fl 32621. Cost will be $55 dollars or $70 dollars depending on what package you chose and you can sign up by calling 352-486-5111 or email sfinnen@levyso.com. or register at www.Levypistolclass.info. Door registrations day of event will be accepted however a $10 surcharge will be added on. Lunch will be provided and additional donations will be appreciated and accepted. On September 1, 2011 deputies responded to 555 East Thrasher Drive in Bronson in reference to a domestic argument. Upon arrival deputies and Investigators made contact with the victim and discovered that she had a gunshot wound to the foot. The investigation revealed that Dorlinda Gilham got into an argument with her sister over health care issues for Gilam's grandson. Gilam became extremely angered during the argument and retrieved a small caliber pistol and shot her sister in the foot. The victim was treated and released at a local hospital. During an interview with Gilam she stated that she had been arguing with her sister for the past two days. Gilam stated that she retrieved the weapon in fit of anger and fired the gun to scare her sister. According to Gilam she shot in front of her sister and the bullet ricocheted and struck her sister's foot. The bullet was recovered in the victim's shoe. Gilam was arrested for aggravated domestic battery and transported to the Levy County Jail.